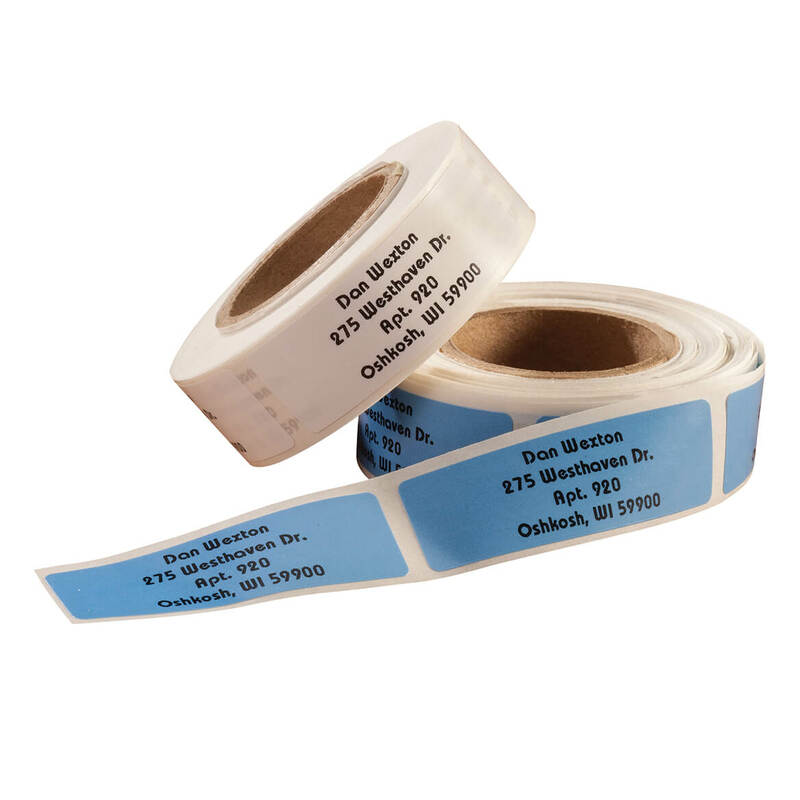 Great self stick labels , and so much quicker than writing out an address .Great colors and designs . This is the second roll I ordered (the first one went in the garbage due to script style type and underline thru the type) and they are fine. Crisp Lettering and Four Rows of Inventiveness! Choosing my lettering and being able to put a "Headline" line at the top was exactly what I wanted. The price was right, the accuracy was perfect, and the labels stick well. Can't tell (from looking at roll of labels) exactly how many I received; it would be better (for checking quality as well as for the number of name-labels received) if they were on a flat sheet instead of in a "roll" form. Very convenient for mailing and easily visible. 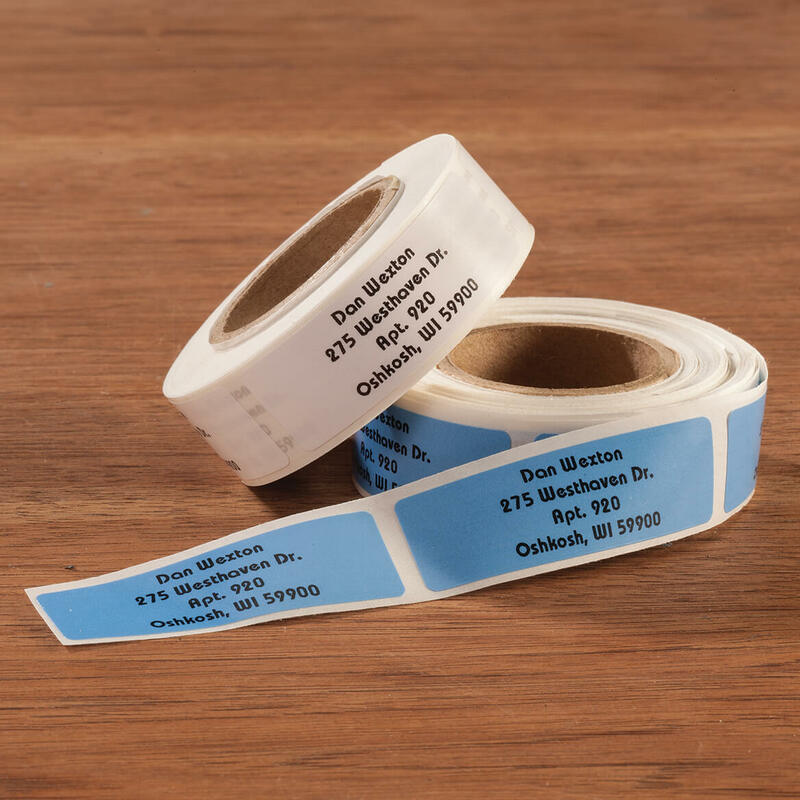 I needed these personalized labels because of future correspondence in my volunteer role as a national officer in a Masonic/Shriners organization during 2018-2019. They are basic and the price was good. Have ordered in the past great quality and good price. I have been hand-writing this on my mother-in-law's menu weekly for some time. This will really save my hand! Easy to read and 200 labels for this price is very good! Chose because I needed more labels. They're well made and look nice. 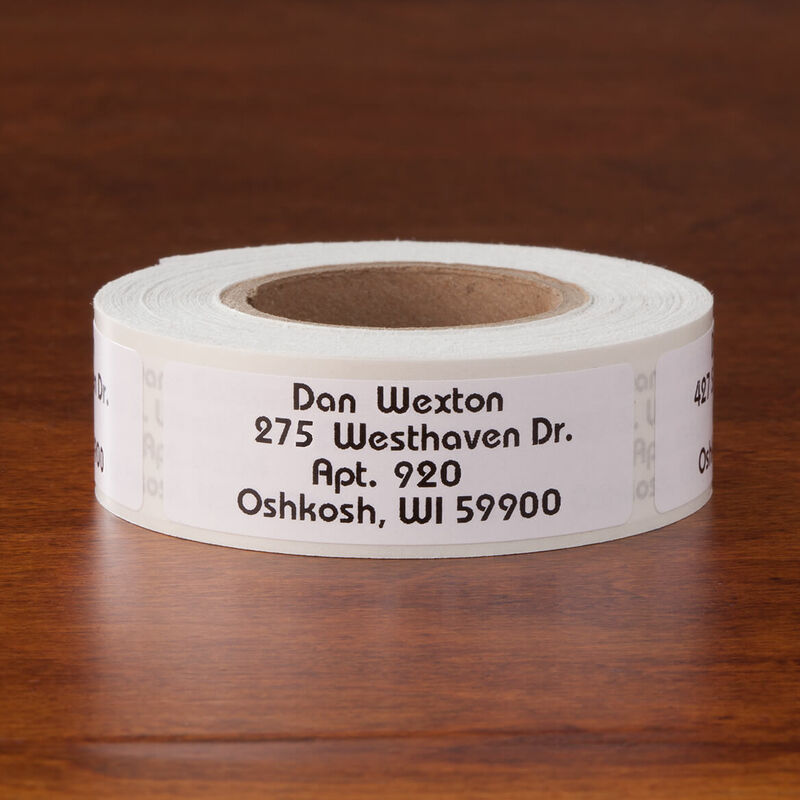 I have been using these return address labels for years and love them. The price is right! Excellent price. Block letter font very clear plus good assortment of colors. I wish that as the items were listed in the cart, the description indicated the selected color. We have an address change due to 911 changes. We still live in the same place. 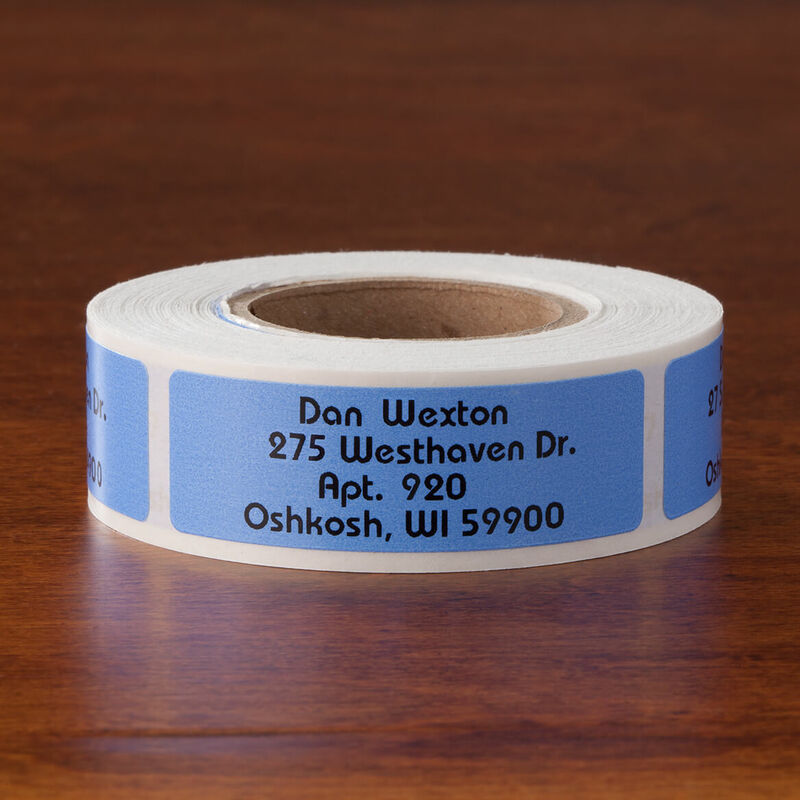 Great price for personalized labels. Looked like ones I purchased before. However, larger quantities (roll of 500) were not listed as an option with this order. Need basic easy-to-read labels for work. Been buying this for many years and I have not had any problem with any orders that I have gotten from you. I have been happy with this item that I have ordered in the past. Convenient and pretty. Offers more than 3 lines of personalization. My daughter has a business and she needs these for advertising and promotional items. Needed new labels and was good price. Do you have this product in a bigger roll? 500? or 1000? BEST ANSWER: Thank you for your question. We do not sell these labels in a bigger roll. We hope this information will be of help to you. How do I specify Block letters for this order? BEST ANSWER: Thank you for your question. The personalization can only be done in the style shown. We hope this information will be of help to you.